Description: Ouro Preto (Portuguese pronunciation: [ˈoɾu ˈpɾetu], Black Gold) is a city in the state of Minas Gerais, Brazil, a former colonial mining town located in the Serra do Espinhaço mountains and designated a World Heritage Site by UNESCO because of its outstanding Baroque architecture. 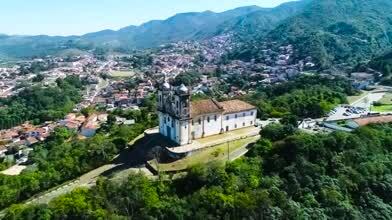 Ouro Preto is located in one of the main areas of the Brazilian Gold Rush. Officially, 800 tons of gold were sent to Portugal in the 18th century. Other gold circulated illegally, and still other gold remained in the colony to adorn churches and for other uses.